STORIES TO CHILL AND GIVE YOU A LAUGH ANGELA GASCOIGNE SHOWS US THERE’S NO PLACE LIKE HOME. I was born in Newcastle Upon Tyne in 1965 and relocated to West Cork, Ireland twelve years ago. I am married with three grown-up sons and lots of pets. 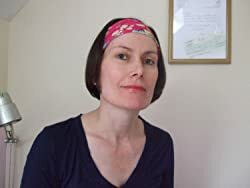 I enjoy writing women’s fiction with a touch of darkness and a hint of humor, also short stories and flash fiction in a variety of genres: spooky, love, humorous and heartwarming. The Seasons of Our Love is my eighth book. It’s a love story based in a seaside location in England. This is my first book to be published in paperback also which is a really exciting step for me! I am currently working on a follow-up novella called, Branded where Rosie and Danny’s story continues with a few new adventures on the horizon and plenty of drama! I also have two books published under the name of Annie Lancaster. Please pay a visit to my Goodreads author blog and website. You can find me on Twitter too! This entry was posted in ANGELA GASCOIGNE, O & P AUTHORS and tagged ANTHOLOGY, HUMOR, SHORTSTORY, SUSPENSE. Bookmark the permalink.